A great bouquet is more than beautiful blooms, Amanda Muis Brown of farm/floral designer Humble Burdock Farms says communication and creativity are just as important. Why is it important for couples to consider buying local flowers? There is a lot to love about locally grown flowers: They are exceptionally beautiful, fresh and affordable. They use far less transportation and packaging than conventional blooms, contribute to our local economy and provide a much-needed connection to the seasons. Our greatest strength is our variety of blooms, colours and foliage—elements you won't find anywhere else. We grow well over 100 types of flowers and foliage from May until late October. How far in advance should folks be thinking about flowers? It is good to reach out as soon as you start planning—even if you are not sure exactly of what you need. Planning a wedding is a process, and floral designers understand you are not going to have everything pinned down right away. Planning the style of your bouquet is a good place to start but other elements, like centrepieces, may take longer as they rely on other factors. We work with the natural flow of your planning process. Also of note: most important weekends are booked up at least six to 12 months in advance. What are some trends this year? I tend towards lush, loose and unmistakably pretty—no matter what colour! But your wedding should reflect you, not the season's trends or colours. How much does the time of year affect design and style? Flower choice comes down to a couple's chosen colours and style. We encourage some flexibility in exact choices, because of the seasonality of flowers. But we can generally predict what will be blooming at a particular time. 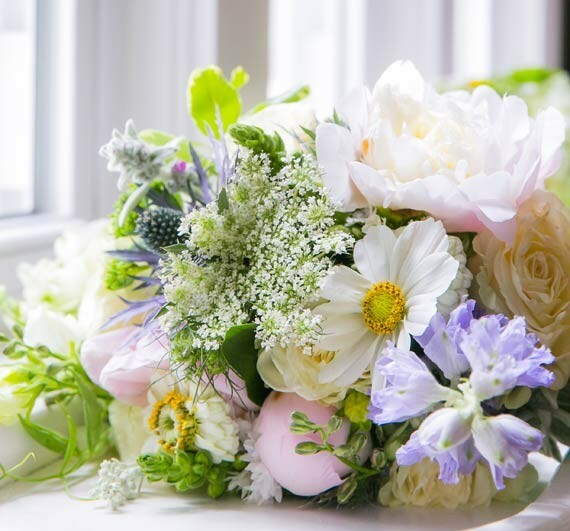 In order to get the best possible flowers for a wedding, we do our best to understand and develop a couple's style during the design consultation process. This is a different way of doing things in the floral industry and it requires good communication and trust. There are a few things we just can't grow, or aren't blooming on your wedding date, so we can incorporate commercially grown flowers into our designs. We endeavour to support Canadian and ethically grown products. How can you make the most of limited funds? The answer to this varies depending on the size of the wedding party and the venue. The bridal bouquet and the groom's boutonniere tend to be the most important elements, as they are in all of the pictures. In considering the venue, focus on the areas that are being looked at the most, like the altar and the head table. Making two larger arrangements will always have more impact than making 20 smaller arrangements and spreading them around. Many brides have been able to save money with our DIY packages which offer loose flowers in their colors. With some help from their friends and family they can create their own bouquets and centerpieces.